These Maple-Roasted Vegetables are the perfect holiday dinner side dish. Not only is this recipe super-easy to make, but the flavors pair with practically everything. Preheat oven to 375°. Coat 2 large baking sheets with nonstick spray. Whisk oil and syrup together in a small bowl. Combine rutabaga, carrots, turnips, parsnips, and onion in a large bowl, drizzle with the syrup mixture, sprinkle with salt and pepper, and toss to coat. 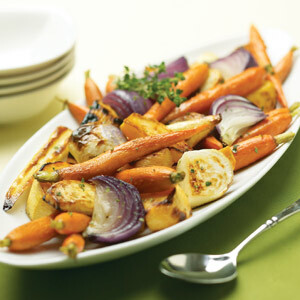 Divide vegetables between baking sheets and roast in the oven until tender and browned, about 45 minutes. Sprinkle with thyme before serving.